Syosset R and R tries to follow as many other book blogs as time allows just because we love books and we also like to see how others are doing it. Recently we saw a blog post onThe Broke and the Bookish called “Julia’s End of Year Book Survey” in which a list of questions about books for 2012 were answered. The list originated as a survey on the blog The Perpetual Page Turner where it is to be found yearly. Syosset R and R has circulated some of the questions to our library staff and hope to be publishing the answers that we get back throughout the first half of January 2013. So our thanks to both of the aforementioned Blogs for the inspiration. Here’s the eighth and last installment (we promise) of questions, answered by Evelyn, Readers’ Services Librarian. Syosset R and R would like to thank those who took the time to answer our questions. Book you recommended to people most in 2012? Wild by Cheryl Strayed. Favorite book cover in 2012? Most beautifully written book read in 2012? In the Shadow of the Banyan by Vaddey Ratner. Book You Are Most Anticipating For 2013? Edward Rutherfurd who wrote New York and many other historical fictions books is coming out with Paris in March. I can’t wait. Syosset R and R tries to follow as many other book blogs as time allows just because we love books and we also like to see how others are doing it. Recently we saw a blog post onThe Broke and the Bookish called “Julia’s End of Year Book Survey” in which a list of questions about books for 2012 were answered. The list originated as a survey on the blog The Perpetual Page Turner where it is to be found yearly. Syosset R and R has circulated some of the questions to our library staff and hope to be publishing the answers that we get back throughout the first half of January 2013. So our thanks to both of the aforementioned Blogs for the inspiration. Here’s the seventh and last installment of questions, answered by Lisa J., Readers’ Services Librarian. Syosset R and R would like to thank those who took the time to answer our questions. Behind The Beautiful Forevers: Life, Death & Hope in a Mumbai Undercity by Katherine Boo. Book(s) you recommended to people most in 2012? Turn of Mind by Alice LaPlante and Defending Jacob by William Landay. Best Book You Read That You Read Based SOLELY On A Recommendation From Somebody Else? And the Mountains Echoed by Khaled Hosseini, David & Goliath by Malcolm Gladwell, How to Get Filthy Rich in Rising Asia by Mohsin Hamid and The Burgess Boys by Elizabeth Strout. The Women of the Cousins’ War by Philippa Gregory. Well, I am not sure I expected to LOVE it but did expect to like it more based on other’s comments: Porch Lights by Dorothea Benton Frank. Um…probably Kate Morton’s The Secret Keeper. Hotel on the Corner of Bitter and Sweet by Jamie Ford(which I liked!!!). World War Z by Max Brooks. I love the zombie apocalypse and I had started reading it a last year but never finished. When I read it for a book club I thought it would get better but it never did. It’s a tie between The Newlyweds by Nell Freudenberger and I’ve Got Your Number by Sophie Kinsella. And Then There Were None by Agatha Christie. I never really read any mystery genre books and I fell in love with the book. I really enjoyed The True Story of Hansel and Gretel by Louise Murphy and read it in a day but for a 2012 book it would have to be Shadow of Night by Deborah Harkness because I was so excited to read the next book in her trilogy. Mix between Shadow of Night by Deborah Harkness, Arcadia by Lauren Groff, and A Hologram for the King by Dave Eggers. Animal Farm by George Orwell, I never read it in high school or college. Fables vol.1 by Bill Willingham, it was recommended in a title swap and I fell in love with the series. Favorite new author(s) you discovered in 2012? I would have to say Laurell K. Hamilton, A.J. Jacobs, Eric Kester, Jay Asher, Elin Hilderbrand, and Kami Garcia. It is a tie between Summerland by Elin Hilderbrand, Shadow of Night by Deborah Harkness, and Beautiful Creatures by Kami Garcia. All are beautifully written in different ways. 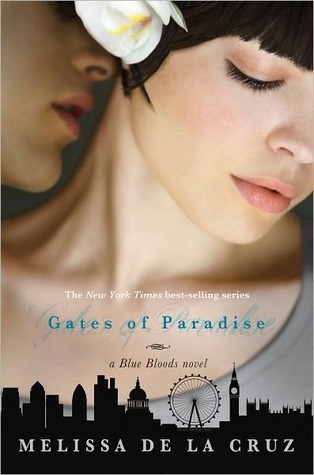 The one that comes to the top of my mind is Gates of Paradise by Melissa de la Cruz. I know there are plenty of others. Best Book Read in 2012? Book You Were Excited About & Thought You Were Going to Love But Didn’t? Impossible to answer – they were all great!